Quality Vacuums from the Heartland. Riccar Vacuums Sales & Factory Service. Sprague's Vacuums is proud to offer the American made Riccar vacuums. Riccar builds high quality vacuums in St. James Missouri using USA and globally sourced components. They are made to last for decades, not months. Stop in and learn the secrets that Riccar owners have known for years. American made vacuums clean better than "department store" vacuums, and last much longer. Best of all, many Riccar models cost less than their heavily advertised Chinese made competitors. Stop into Sprague's and see why a better vacuum represents real value! ﻿The Riccar Radiance & Brilliance Series features the revolutionary Tandem Air System setting a new standard for vacuums in its class. This newest line of world-class vacuums from Riccar offers the perfect combination of performance, luxury and value. 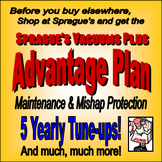 All Tandem Air Machines come standard with the Sprague's Vacuum Advantage Plan! ​Tandem Air Technology combines two types of cleaning technology into one vacuum for exceptional carpet cleaning, strong suction for attachments and advanced HEPA media filtration. THIS, is what department store vacuums can't do! Riccar Vibrance Series, Available at Sprague's Vacuums Plus. These are our best selling vacuums at Sprague's. Stop in and see why. ​Click to see why THIS Riccar vacuums is my top seller! Sprague's not only sells Riccar vacuum cleaners, but is also a factory service center. As a warranty repair station, Sprague's Vacuums receives the best pricing and pass the savings to our customers. Stop in and see how much you can save on the best vacuum you've ever owned. Bring in your old vacuum for trade and save even more! As a warranty service center, Sprague's guarantees the lowest price on Riccar vacuums. To learn more about Riccar products, discounts and promotions available from Sprague's, please call us at 330-609-5455 or use the contact form below. All Riccar makes and models are available! Please call or visit our store for current Riccar Selection. To learn more about Riccar Vacuums, visit www.Riccar.com.